After a clunky few scenes that seem content to recall the first film more than expand on it, “Ralph Breaks the Internet,” the sequel to 2012’s beloved “Wreck-It Ralph,” really opens up and delivers for kids and adults. It even becomes the rare product of the Hollywood machine that questions some of the lessons that have come before it, particularly in relation to the myth of the “Disney Princess,” but also with a well-done theme that offers a richer truth than a lot of family entertainment. As a parent of three boys, trust me when I tell you that a lot of kids movies are about “getting people together”—to form a team, stop a bad guy, solve a problem, etc.—and no one is denying the importance of team-building as a lesson for kids, but “Ralph Breaks the Internet” dares to encourage kids to not only be themselves but allow their friends to be true to their wants and needs as well. Your friend doesn’t have to be exactly like you to be your friend. It’s a message that’s very well-threaded through an entertaining, clever ride. Unlike “Incredibles 2” which compressed real-world time to produce a sequel that picked up immediately after the action of the first film, six years have gone by in the world of Ralph (John C. Reilly) and Vanellope (Sarah Silverman). The former villain is happy with his routine of working in his game in Litwak’s arcade during the day and hanging out with his best bud at night. They even get some recreation time in the Tron game and hang out at Tapper’s to drink root beer. Felix (Jack McBrayer) and Calhoun (Jane Lynch) are back as well, but this is all mere prologue to the bulk of the film, which unfolds when Litwak plugs in a WiFi router. Seeking something more adventurous than her repetitive tracks in Sugar Rush, as well as a new wheel to fix her broken game, Vanellope races off to the mythical internet and Ralph follows. Just as the first “Wreck-It Ralph” allowed for consistent references to the world of arcade games, sending its protagonists to the internet allows for a regular flow of jokes and easter eggs for adults and kids. The design of the internet here looks a little like the future sky-cities of “The Fifth Element,” with avatars of real-world users racing in every direction. Those exhausted by real-business branding in family films may want to turn away as the creators of “Ralph” have blended their reality with our own, resulting in numerous shots of real logos for companies like Amazon, eBay, and Pinterest alongside made-up ones like Knowsmore and a hit game called Slaughter Race. That GTA-inspired racing game is where Vanellope discovers that her skills are going to waste in Sugar Rush. She might want more of her digital life than Ralph, and the internet promises new opportunities. There are a number of smart themes woven through “Ralph Breaks the Internet” in ways that kids may not fully grasp but are open for conversations they can have with their parents after. Unlike soulless product placement films like “The Emoji Movie,” the writers here grapple with the concept of the internet as an amplifier, for good and bad. Without spoiling, the final act of “Ralph Breaks the Internet” hinges on how the internet broadcasts Vanellope's and Ralph’s insecurities, something it arguably has the power to do for everyone. Of course, kids will go for the action and comedy, both of which are here in abundance, even if the script feels like it could have used a little tightening (112 minutes is pretty lengthy for an animated adventure). 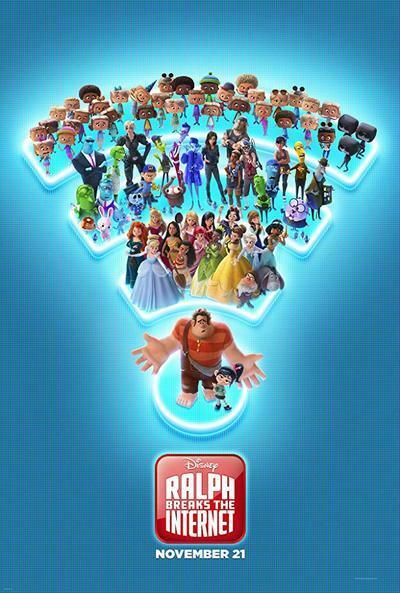 For the most part, “Ralph Breaks the Internet” is astute and funny, especially in a fantastic subplot involving Vanellope meeting the “Disney Princesses,” the heroines from films like “Snow White and the Seven Dwarves,” “Tangled,” “Pocahontas,” “The Little Mermaid,” and many more. They tell her how they break into song when they’re sad, usually while looking at a body of water, and how often they need men to save them. It’s an incredibly witty scene that wrestles with Disney’s legacy when the filmmakers could have just included another tribute to the company that pays their bills. “Ralph Breaks the Internet” works best when it takes risks like that. So many family filmmakers think they need to take as few risks as possible—offering easily digestible content that parents can use as a babysitter more than a teaching tool. But “Ralph Breaks the Internet” works because it doesn’t pander, and it doesn’t simplify. In the first movie, Ralph learned he was more than a bad guy. In this one, he learns that it’s OK to want variety and stand out from the crowd. If only more animators could learn the same lesson as Ralph.